Samarra is a city in central Iraq, which served as the capital of the Abbasid Caliphate from 836 to 892. Founded by the caliph al-Mu'tasim, Samarra was briefly a major metropolis that stretched dozens of kilometers along the east bank of the Tigris, but was largely abandoned in the latter half of the 9th century, especially following the return of the caliphs to Baghdad. Due to the relatively short period of occupation, extensive ruins of Abbasid Samarra have survived into modern times. The layout of the city can still be seen via aerial photography, revealing a vast network of planned streets, houses, palaces and mosques. Studies comparing the archeological evidence with information provided by Muslim historians have resulted in the identification of many of the toponyms within the former city. The archeological site of Samarra was named by UNESCO as a World Heritage Site in 2007, calling it "the best preserved plan of an ancient large city." The modern city bearing the same name lies within the Abbasid ruins. The toponym Samarra is known to have existed prior to the Islamic period. Classical authors mention the name in various forms, including the Greek Suma (Σουμᾶ), the Latin Sumere and the Syriac Šumara. The formal name of the Abbasid city was Surra Man Ra'ā (Arabic: سر من رأى‎), meaning "he who sees it is delighted". This name appears on coins and was adopted by some medieval writers. Other sources, however, use Sāmarrā (سامرا) or Sāmarrā' (سامراء) as variants of the pre-Islamic name, and the latter form eventually became the standard spelling. Decorative stucco panel, in Style C, or the "bevelled style"
Samarra was founded by the eighth Abbasid caliph al-Mu'tasim (r. 833–842) in 836. Al-Mu'tasim's immediate motivation for the decision was a need to find housing for his newly formed Turkish and other army regiments. These troops, who were from groups that had previously held only a marginal role in the Islamic world, were deeply unpopular among the residents of Baghdad, and violent incidents had repeatedly broken out between the soldiers and Baghdadis. Al-Mu'tasim therefore resolved in ca. 835 to depart from Baghdad, the usual seat of the Abbasid caliphs since 762, and create a new capital city of his choosing. Following a period of searching for an ideal spot, al-Mu'tasim settled on a site approximately 80 mi (130 km) north of Baghdad on the east side of the Tigris, near the head of the Nahrawan Canal. After sending men to buy up the local properties, including a Christian monastery, the caliph had his engineers survey the most suitable places for development. By 836, buildings had been erected at the site and al-Mu'tasim moved into the new city. From the start, construction at Samarra was undertaken on a massive scale. Space was no object; land was plentiful and cheap, with little in the way of preexisting settlements to hinder expansion. Al-Mu'tasim marked out various allotments in the new city and granted these spaces to various elites of the army and administration for them to develop. Numerous cantonments were established for the army regiments, who in many cases were intentionally segregated from the residences for the general populace. Markets, mosques and baths for the people were built, together with a number of palaces for the caliph and other prominent individuals. Materials and laborers were shipped in from various parts of the Muslim world to help with the work; iron-workers, carpenters, marble sculptors and artisans all assisted in the construction. Founding a new capital was a public statement of the establishment of a new regime, while allowing the court to be "at a distance from the populace of Baghdad and protected by a new guard of foreign troops, and amid a new royal culture revolving around sprawling palatial grounds, public spectacle and a seemingly ceaseless quest for leisurely indulgence" (T. El-Hibri), an arrangement compared by Oleg Grabar to the relationship between Paris and Versailles after Louis XIV. In addition, by creating a new city in a previously uninhabited area, al-Mu'tasim could reward his followers with land and commercial opportunities without cost to himself and free from any constraints, unlike Baghdad with its established interest groups. In fact, the sale of land seems to have produced considerable profit for the treasury: as Hugh Kennedy writes, it was "a sort of gigantic property speculation in which both government and its followers could expect to benefit". After al-Mu'tasim's death, his successor al-Wathiq (r. 842–847) remained in Samarra. His decision to stay convinced the residents of the new city's permanence, and a fresh round of construction began during his reign. Al-Wathiq himself built a new palace, the Haruni (al-Wathiq's given name was Harun) on the bank of the Tigris, which became his new residence. Al-Mutawakkil (r. 847–861) aggressively pursued new construction, extending the central city to the east and building the Great Mosque of Samarra, the cantonment of Balkuwara and numerous palaces. After moving to Damascus in 858, he returned to Iraq and undertook his most ambitious project, the new city of al-Mutawakkiliyya to the north of Samarra. Included in the new area was the palace of al-Ja'fari (Ja'far being his given name), which he moved into in 860. In the following year, however, he was assassinated, and al-Mutawakkiliyya was abandoned soon after. The decade following al-Mutawakkil's assassination was a turbulent period, sometimes known as the Anarchy at Samarra, during which the capital was frequently beset by frequent troop riots and coups. Al-Mutawakkil's son al-Muntasir (r. 861–862) abandoned al-Ja'fari and moved back to the Jawsaq palace, which remained the residence of his successors. Al-Musta'in (r. 862–866), finding it impossible to control the Samarran regiments, left the city and attempted to establish himself in Baghdad in 865, but the Turks and other troops responded by deposing him and besieging Baghdad until the caliph agreed to abdicate. His two successors, al-Mu'tazz (r. 866–869) and al-Muhtadi (r. 869–870), were similarly overthrown by the army. like an elephant being untusked. Poem composed by the Abbasid prince Abdallah ibn al-Mu'tazz, who was born in Samarra, regarding the decline of the city. Al-Mu'tamid (r. 870–892) undertook the last known building projects in Samarra, but in the later period of his reign he appears to have spent less time in the city. After his death, al-Mu'tadid (r. 892–902) formally returned to Baghdad, thus bringing an end to the Samarran interlude. Al-Muktafi (r. 902–908) at one point considered moving back to Samarra and encamped in the Jawsaq palace, but was eventually dissuaded after his advisers informed him of the high costs of the plan. On its own, Samarra had little to incentivize residents to stay; the water supply was problematic and the city seems to have been heavily dependent on supplies from elsewhere. As long as the caliphs were willing to pour vast sums of money into the city, it continued to survive; with the return of the caliphs to Baghdad, this investment dried up and soon much of the city was abandoned. In the following centuries, a few isolated settlements survived within the ruins, but the vast portion of the city soon became uninhabited. The known remains of Samarra occupy an area of approximately 58 km2 (22 sq mi), mostly on the east side of the Tigris. Out of 6,314 registered buildings at the site (as of 1991), only nine still have any components of significant height; the vast majority of the ruins consist of collapsed mounds of rammed earth and scattered debris. At ground level, the remains are mostly unimpressive; when viewed from the air, however, the entire plan of the Abbasid city, with its buildings and street pattern, can clearly be seen. The core area of the city was initially constructed in the reign of al-Mu'tasim, with further development taking place under al-Wathiq and al-Mutawakkil. The street layout of this area was dominated by a series of long, broad avenues which ran north-to-south and northwest-to-southeast. These avenues are described in detail by the Muslim historian and geographer al-Ya'qubi, who lists the various buildings and allotments which were located along each one. In between the avenues were a great number of smaller streets and housing blocks, together with several larger buildings. The residents of this section of the city were a mixture of civilians and military personnel. In some cases, the cantonments of the troops were explicitly segregated from the rest of the populace. Numerous army commanders, together with their regiments, were granted allotments here, including those of the Turks, Faraghina, Ushrusaniyya, Maghariba, Ishtakhaniyya, Jund, Shakiriyya, Arabs and Khurasanis. Several bureaucrats, Abbasid princes and other personages also had allotments along the avenues. Besides residences, a number of other buildings were located in this area, including the public and private stables, the office of the Bureau of the Land Tax (diwan al-kharaj), and the great prison. The markets, as laid out by al-Mu'tasim, are described as having broad rows, with each type of merchandise sold in a separate section. Near the markets was the gibbet from which the rebel Babak Khorramdin was hanged (khashabat Babak), and which served as a place for displaying executed persons. On the Tigris were a great number of wharves, where provisions from Mosul and other cities were unloaded. The original mosque, laid out by al-Mu'tasim, soon became too small for the city's residents; it was eventually demolished by al-Mutawakkil, who replaced it by building the Great Mosque of Samarra in the vicinity of al-Hayr. This mosque, the largest in the world at the time, measured 239 m × 156 m (784 ft × 512 ft) and had 17 aisles in the prayer hall. An enclosure wall measuring 443 m × 374 m (1,453 ft × 1,227 ft) featured covered porticoes to accommodate additional worshippers. 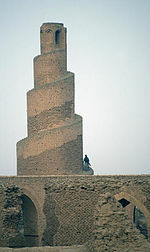 The spiral minaret, 52 m (171 ft) high, still stands in the rear of the mosque. Al-Matira was a cantonment located to the south of central Samarra. It was established two farsakhs (12 km) south of the initial city construction, at the site of a preexisting village. Al-Matira was first allotted by al-Mu'tasim to the Ushrusanan general al-Afshin, together with the Ushrusaniyya and others in his service. Al-Afshin built a residence for himself, and on the caliph's orders, he also constructed a small market, as well as mosques and baths. Following the execution of al-Afshin in 841, al-Matira was granted to the Turkish general Wasif by al-Wathiq. During the reign of al-Mutawakkil, his son al-Mu'ayyad took up residence there. Al-Matira survived the abandonment of Samarra by the caliphs, and remained occupied at least until the 13th century. On the northern end of central Samarra was the Palace of the Caliph (dar al-khalifa). This site served as the official seat of government during the reigns of al-Mu'tasim, al-Muntasir, al-Musta'in, al-Mu'tazz, al-Muhtadi and al-Mu'tamid. The palace complex consisted of two primary buildings. The larger one has been identified as the Dar al-'Amma (Public Palace), where the caliph sat in audience and conducted official business, and where the public treasury (bayt al-mal) was housed. On the western side of the palace was the Bab al-'Amma (Public Gate), whose triple iwan still survives. The Bab al-'Amma was often used as a location for public executions and displaying the remains of those killed. The smaller building to the north has been identified as the Jawsaq al-Khaqani, which served as the private residence of the caliph. Construction of the Jawsaq palace was entrusted by al-Mu'tasim to the Turk Khaqan 'Urtuj, the father of al-Fath ibn Khaqan and Muzahim ibn Khaqan. It was located within an enclosure wall, and on the eastern side was a maydan or square which overlooked the beginning of a racecourse in al-Hayr. During the violent period following the death of al-Mutawakkil, the Jawsaq palace is frequently mentioned as serving as a prison for prominent persons; al-Mu'tazz, al-Mu'ayyad, al-Muwaffaq, al-Muhtadi, and al-Mu'tamid all were incarcerated there at various points in time. On the northern side of the Dar al-Khalifa was a walled cantonment area. This site has been identified as the area allotted by al-Mu'tasim to Khaqan 'Urtuj and his followers, who were said to be segregated from the general populace. At some point, the cantonment appears to have housed the servants who worked in the caliphal palace. A smaller palace (possibly the 'Umari palace built by Khaqan 'Urtuj) and storehouses were located here, and al-Hayr marked the eastern boundary of the area. Immediately to the north of the cantonment of Khaqan 'Urtuj was a second, diamond-shaped area. This cantonment is tentatively identified as al-Waziriyya, containing the Waziri palace built by Abu al-Wazir. Like the cantonment of Khaqan 'Urtuj, it may have served as housing for the caliphal servants. Al-Karkh and al-Dur were two cantonments located several kilometers to the north of Samarra proper. Built during the reign of al-Mu'tasim, both areas seem to have housed Turkish regiments and are frequently mentioned together. Al-Karkh (sometimes called Karkh Samarra in the sources) was built near a preexisting settlement, Shaykh Wali. It was allotted to the Turkish general Ashinas, with strict orders that no strangers (i.e., non-Turks) were to be allowed to live there, and that his followers were not to associate with people of Arab culture. Ashinas built a palace which contained a mosque; after his death, this building was given to al-Fath ibn Khaqan. Details of the settlement of al-Dur, to the north of al-Karkh, are less well known, but it is clear that Turks were settled in this area as well. Al-Ya'qubi describes the building of mosques, baths and markets in al-Karkh and al-Dur. Both areas continued to be populated following the abandonment of Samarra and seem to have been considered as suburbs of Samarra proper; the tenth century geographer al-Muqaddasi, for example, refers to both localities as dependencies of Samarra. They appear to have survived until at least the 13th century. Al-Hayr was a massive hunting reserve to the east of Samarra. Surrounding it was a wall of coursed earth, enclosing an area of 114 km2 (44 sq mi). The western portion of the wall bordering the central city was repeatedly demolished and rebuilt to make way for new construction, including that of the Great Mosque. Within al-Hayr were a series of racecourses, with each track measuring several kilometers in length. The layout of these racecourses varied; one was parachute-shaped, another bottle-shaped, and a third shaped as a cloverleaf. Al-Haruni was a palace built by Harun al-Wathiq on the Tigris. Al-Wathiq resided here during his reign, as did al-Mutawakkil prior to the construction of al-Ja'fariyya in 859. Balkuwara was a cantonment located to the south of al-Matira. A major feature of this site was the palace, which served as the residence of al-Mu'tazz during the caliphate of his father al-Mutawakkil. Built during al-Mutawakkil's reign, the palace overlooked the Tigris and was surrounded by two enclosure walls, with the outer wall measuring 1,165 m × 1,171 m (3,822 ft × 3,842 ft) and the inner measuring 464 m × 575 m (1,522 ft × 1,886 ft). Excavation work undertaken in the early 20th century revealed decorative elements consisting of stucco, frescoes, colored glass windows and niches. Al-Mutawakkiliyya was the largest building project of the caliph Ja'far al-Mutawakkil, who ordered the construction of a new city on the northern border of al-Dur in 859. This city, which was built in the vicinity of the settlement of al-Mahuza, was intended to replace Samarra as the residence of the caliphs. Al-Mutawakkiliyya consisted of an unwalled area, through the center of which ran a north-south avenue. On the western side of the avenue was the Abu Dulaf Mosque. 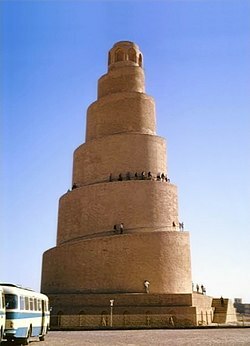 Like the Great Mosque of Samarra, the Abu Dulaf Mosque included a spiral minaret, measuring 34 m (112 ft) high. The avenue ultimately led to the Ja'fari palace, which served as al-Mutawakkil's new residence. It was located in the north of al-Mutawakkiliyya and separated from the rest of the city by a wall. A canal was also dug to supply water to the new city, but this project failed and the canal never functioned properly. The building al-Mutawakkiliyya marked the high point of the expansion of Samarra; al-Ya'qubi reports that there was continuous development between al-Ja'fari and Balkuwara, extending a length of seven farsakhs (42 km). Despite the significant amount of money spent to construct it, however, al-Mutawakkiliyya was occupied for only a very short time. Al-Mutawakkil took up residence in al-Ja'fari in 860 and transferred the government bureaucracies (diwans) from Samarra, but following his assassination in December 861, his son and successor al-Muntasir ordered a return to Samarra and took up residence in the Jawsaq palace instead. 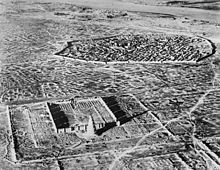 Al-Musharrahat was a complex in the vicinity of Qadisiyya, to the south of Samarra. On the north side was a palace, and on the east and west sides were housing units. 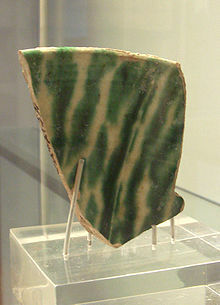 A large trapezoidal enclosure branched out from the complex and extended several kilometers to the north into al-Hayr. The site, which evidently served as a hunting palace, is identified with al-Shah, probably built during the reign of al-Mutawakkil. Although the majority of the development in Samarra was located on the east side of the Tigris, several buildings were also constructed on the west bank. Al-Mu'tasim built a bridge across the Tigris and founded developments, orchards and gardens on the west side. Al-Istablat was a large walled structure located to the south of Samarra. The northern part consisted of a palace that overlooked the Tigris, while the southern area contained a number of housing units. A long outer wall enclosing al-Istablat and the surrounding area was also built. Al-Istablat is believed to be al-'Arus, one of the palaces built by al-Mutawakkil. Qasr al-'Ashiq was a palace located opposite al-Haruni and the Dar al-Khalifa. It is the best preserved of the Samarran palaces and the main building was nearly completely restored in the late 20th century. The plan of the palace appears to have been based on that of the Jawsaq. It is identified with al-Ma'shuq, which was built by al-Mu'tamid and served as his residence for part of his caliphate. Qubbat al-Sulaybiyya was a small octagonal building to the south of Qasr al-'Ashiq. An inner octagonal structure which featured a dome was reached by ramps ascending on four sides. Restoration work in the 1970s included the rebuilding of the dome. Samarra during the early 20th century. Samarra first drew the attention of archeologists around the turn of the 20th century, and excavation work was conducted by Henri Viollet, Friedrich Sarre, and Ernst Herzfeld in the period leading up to World War I. Aerial photographs were taken between 1924 and 1961, which preserved portions of the site that have since been overrun by new development. 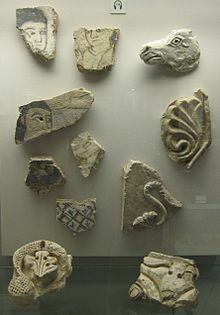 The Directorate-General of Antiquities of Iraq restarted excavations between 1936 and 1940, and continued in the 1960s and 1970s. Excavation and restoration work took place between 1980 and 1990. Around the same time, Alastair Northedge surveyed the surviving portions of the city, and has since published several works on the subject. Despite these projects, an estimated 80% of the site was still unexcavated around the beginning of the 21st century. Developments in the 20th century, including the completion of the Samarra Barrage in the 1950s and growth of the modern city of Samarra, have resulted in parts of the ruins being overrun by new construction and cultivation. The Iraq War (2003–2011) also caused damage to the site, including in 2005 when a bomb was detonated at the top of the minaret of the Great Mosque. The palace complex of Sur Ashinas was the site of fighting between the Islamic State of Iraq and the Levant and the Iraqi Army and tribal militias during the ISIL offensive in Iraq in 2015. The Samarra Archaeological City was declared a World Heritage Site by UNESCO in 2007. ^ a b c UNESCO. ^ Al-Ya'qubi 1892, pp. 256–58; Al-Tabari 1985–2007, v. 33: pp. 25-26; Al-Mas'udi 1873, pp. 119 ff. ^ Kennedy 2004a, p. 163; El-Hibri 2011, pp. 296–297. ^ Kennedy 2004a, p. 163. ^ Al-Ya'qubi 1892, pp. 265–67; Al-Tabari 1985–2007, v. 38: pp. 154-56, 170, 190-91; Northedge 2008, pp. 195 ff. The sources agree that the sums that al-Mutawakkil spent on his various projects were enormous, and were likely missed in the decade following his death, when the government frequently ran into fiscal crises. ^ EI2 1960–2004, s. vv. "Al-Muntasir," "Al-Musta'in," "Al-Mu'tazz," "Al-Muhtadi". ^ Tuetey 1985, p. 260 no. 145. ^ Northedge 2008, pp. 239 ff. ^ Northedge 2008, pp. 97–100, 122 ff. ^ Northedge 2008, pp. 100 ff. ^ Al-Ya'qubi 1892, pp. 255–56; Northedge 2008, pp. 100 ff., 183 ff. ^ Al-Ya'qubi 1892, pp. 255–56; Northedge 2008, pp. 98 ff. ^ CEMML, 060. Samarra — Al-Mutawakkil Mosque & Minaret al-Malwiya. ^ CEMML, 059. Samarra — Bab al-'Amma, the Jawsaq al-Khaqani Palace Gate. ^ Gordon 2001, p. 199; Al-Tabari 1985–2007, v. 35: pp. 12, 30-31, 140, 152, 164; v. 36, pp. 76, 78, 85, 86, 87, 91. 95, 96, 99; Northedge 2008, pp. 173 ff. ^ CEMML, 056. Samarra — Balkuwara Palace. ^ Al-Ya'qubi 1892, p. 266; Northedge 2008, pp. 211 ff. ^ CEMML, 055. Samarra — Abu Dulaf Mosque and Minaret. ^ Al-Ya'qubi 1892, pp. 266–67; Northedge 2008, p. 211 ff. ^ Al-Ya'qubi 1892, pp. 263–64; Northedge 2008, pp. 227 ff. ^ CEMML, 061. Samarra — Qasr al-Ashiq. ^ CEMML, 063. Samarra — Sulaybiya Mausoleum. ^ Finster 2004, p. 241, credits Northedge and his work for ensuring that "Samarra was not consigned to oblivion." "Ancient minaret damaged in Iraq". BBC. 1 April 2005. Retrieved 19 July 2015. The Encyclopedia of Islam, New Edition. Leiden and New York: BRILL. 1960–2004. El-Hibri, Tayeb (2011). "The empire in Iraq, 763–861". In Robinson, Chase F. The New Cambridge History of Islam, Vol. 1: The Formation of the Islamic World, Sixth to Eleventh Centuries. Cambridge and New York: Cambridge University Press. pp. 269–304. ISBN 978-0-521-83823-8. Finster, Barbara (2004). "Review: A Medieval Islamic City Reconsidered: An Interdisciplinary Approach to Samarra". Journal of Islamic Studies. Oxford University Press. 15 (2): 240–243. doi:10.1093/jis/15.2.240. Retrieved 20 July 2015. "Iraq's most significant ancient sites and monuments". Colorado State University - Center for Environmental Management of Military Lands. Retrieved 20 July 2015. Kennedy, Hugh (2004a). The Prophet and the Age of the Caliphates: The Islamic Near East from the Sixth to the Eleventh Century (Second ed.). Harlow: Pearson Longman. ISBN 0-582-40525-4. Kennedy, Hugh (2004b). When Baghdad Ruled the Muslim World: The Rise and Fall of Islam's Greatest Dynasty. Cambridge, MA: De Capo. ISBN 0-306-81480-3. Le Strange, Guy (1905). The Lands of the Eastern Caliphate: Mesopotamia, Persia, and Central Asia, from the Moslem Conquest to the Time of Timur. Cambridge: Cambridge University Press. Leisten, Thomas (2003). Excavation of Samarra, Volume I, Architecture: Final Report of the First Campaign, 1910-1912. Mainz am Rhein: Von Zabern. ISBN 3-8053-1877-4. Al-Mas'udi, Ali ibn al-Husain (1873). Les Prairies D'Or, Tome Septieme. Ed. and Trans. Charles Barbier de Meynard and Abel Pavet de Courteille. Paris: Imprimerie Nationale. Al-Muqaddasi, Muhammad ibn Ahmad (2001). The Best Divisions for Knowledge of the Regions. Trans. Basil Collins. Reading: Garner Publishing Limited. ISBN 1-85964-136-9. Northedge, Alastair (2006). "Abbasid Earth Architecture and Decoration at Samarra, Iraq". The Conservation of decorated Surfaces on Earthen Architecture. Proceedings from the International Colloquium Organized by the Getty Conservation Institute and the National Park Serevice, September 22–25, 2004. Los Angeles: Getty Publications. ISBN 0-89236-850-0. Northedge, Alastair; Kennet, Derek (2015). Archeological Atlas of Samarra: Samarra Studies II, 1. London: The British School of Archeology in Iraq. ISBN 978-0-903472-31-9. Northedge, Alastair (1991). "Creswell, Herzfeld, and Samarra". Muqarnas. BRILL. 8: 74–93. doi:10.2307/1523156. JSTOR 1523156. Northedge, Alastair (2008). The Historical Topography of Samarra: Samarra Studies I. London: The British School of Archeology in Iraq. ISBN 9780903472227. Northedge, Alastair (1993). "An Interpretation of the Palace of the Caliph at Samarra (Dar al-Khilafa or Jawsaq al-Khaqani)". Ars Orientalis. Freer Gallery of Art. 23: 143–170. JSTOR 4629446. Northedge, Alastair (1990). "The Racecourses at Samarra". Bulletin of the School of Oriental and African Studies, University of London. Cambridge University Press. 53 (1): 31–56. doi:10.1017/s0041977x00021236. JSTOR 618966. Rasheed, Ahmed; Evans, Dominic (28 February 2015). Char, Pravin, ed. 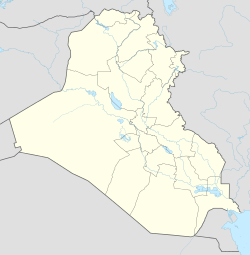 "Islamic State fighters attack Samarra ahead of army offensive". Reuters. Retrieved 23 November 2015. "Samarra Archaeological City". UNESCO. 2007. Retrieved 19 July 2015. "Samarra Resource Page". The Freer Gallery of Art and the Arthur M. Sackler Gallery. Retrieved 20 July 2015. Shaw, Ian; King, Geoffrey (1999). "Samarra". In Shaw, Ian; Jameson, Robert. A Dictionary of Archaeology. Oxford: Blackwell Publishers. pp. 505–506. ISBN 0-631-17423-0. Tuetey, Charles Greville (Trans.) (1985). Classical Arabic Poetry: 162 Poems from Imrulkais to Ma'arri. London: Kegan Paul International. ISBN 0710307276. Al-Ya'qubi, Ahmad ibn Abu Ya'qub (1892). de Goeje, M. J., ed. Bibliotheca Geographorum Arabicorum, Pars Septima: Kitab al-A'lak an-Nafisa VII, Auctore Abu Ali Ahmad ibn Omar Ibn Rosteh, et Kitab al-Boldan, Auctore Ahmad ibn Abi Jakub ibn Wadhih al-Katib al-Jakubi. Leiden: E. J. Brill.